Hello everyone! 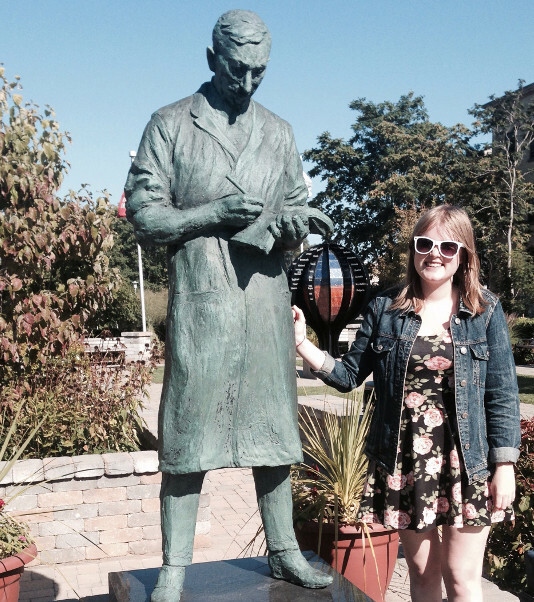 My name is Heather, and I am a graduate student in the Public History Program at the University of Western Ontario. I’m extremely lucky to be doing my research assistantship here at the Banting House National Historic Site of Canada, where I will be able to expand my knowledge of working at museums and historical sites. One of my main areas of interest in history is the importance of education and accessibility, so I am excited by the opportunity to work with all the visitors to the museum and to raise public awareness about this aspect of diabetes research history. Before I started here, I knew very little about Fredrick Banting. I knew that he discovered insulin, that he won the Noble Prize, and that he was born in Alliston, Ontario. I knew that Banting House commemorated the time he spent in London, but I had unfortunately never visited before, and wasn’t sure what to expect. After just a few days I’m already blown away by what I’ve learned and the diversity of the exhibits here. From the history of diabetes and insulin, to Banting’s personal life, to how his story and discovery have been interpreted by the world, I’m amazed by what a full understanding of his life and impact you can gain by exploring the house. I (like many other people, I think) have always tended to associate Banting solely with his discovery of insulin without giving much thought to the other aspects of his life. I was surprised by the extent of his military service and his early struggles as a surgeon in London. The most surprising thing that I’ve learned (and my favourite) is that Banting was a painter and friends with the Group of Seven. I was fascinated to see the progression of his art and the growing influence of the Group of Seven in his work, as his personal interests and passions outside of medicine are not something that is often acknowledged. The exhibits about the development of insulin and the impact it has had on people diagnosed with diabetes has really opened my eyes to the significance of Banting’s discovery. Diabetes is an illness that affects millions of people worldwide, and the “Dear Dr. Banting” letters are a testament to how far a breakthrough of this kind can reach. Visiting his bedroom and seeing the outpouring of gratitude is a moving experience, and I can only begin to imagine what it means to visitors whose lives are closely connected to diabetes. So far I’ve been reading up on the policies that go into maintaining a museum and national historical site, which have been more interesting than I anticipated. I’ve also began to do a little work with the collection of pictures, documents, and artifacts, which is something that I’m eager to gain more experience with. I’m excited to be part of the team and to help bring this important part of Canadian and medical history to life. I look forward to sharing my journey and I can’t wait to see what comes next!